Martine Chaisson Gallery is pleased to present multi-media artist Caroline Wright. For this exhibition, she will present a series of acrylic and mixed-media paintings as well as a dance performance as an extension of her work for opening night. Caroline Wright is a painter, musician, and dancer, interested in what happens when color, sound, and movement translate each other. Wright received her MFA from the School of the Art Institute of Chicago, and her BA in Visual Art and Art History from Brown University. After college, Wright moved to Paris to find a collective of artists from all over the world in a squatted, abandoned state building in Belleville. This creative and challenging environment imprinted the possibility of a life supported by and for art-making. She returned to Austin in 2007 to participate in the burgeoning art community of her hometown, and was a 2012 finalist for Best 2D Artist in the Austin Visual Arts Awards. Wright enjoys performing and collaborating, and her projects include live painting with a soprano in the atrium of the Blanton Museum of Art, live projected painting with dancers at Ballet Austin, and singing in a stairwell in the Performing, Writing Symposium in Wellington, New Zealand, where she was also artist-in-residence at New Zealand Pacific Studio. 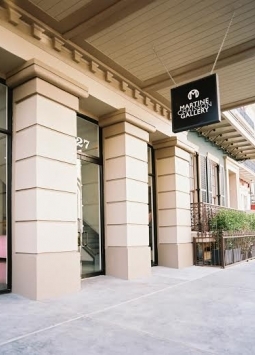 About Martine Chaisson Gallery Martine Chaisson Gallery is located in the New Orleans’ Historic Warehouse District at 727 Camp Street. With an emphasis on quality, the gallery represents emerging and established artists providing a variety of original contemporary art including painting, drawing, photography, and sculpture to enhance both corporate and individual environments. For more information please contact Kristen Grant at 504.302.7942 or martinechaissongallery@gmail.com.